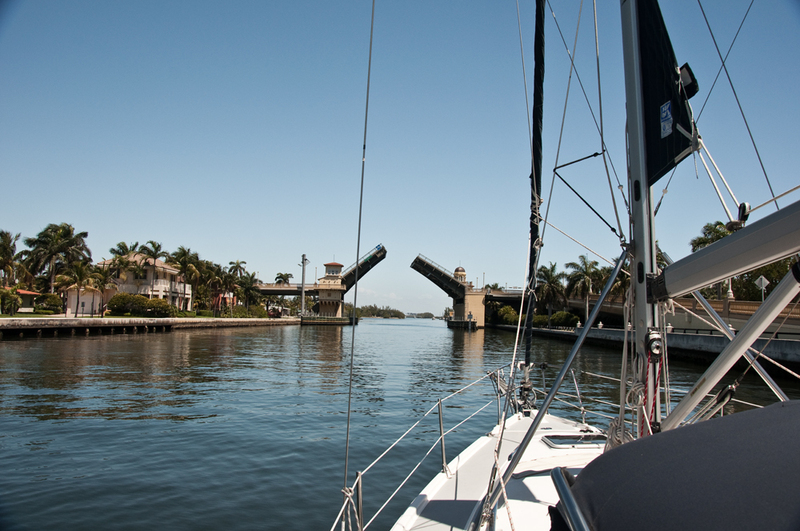 The voyage on the ICW between Miami and Fort Lauderdale is all about bridges. There are around 10 that you need to navigate. 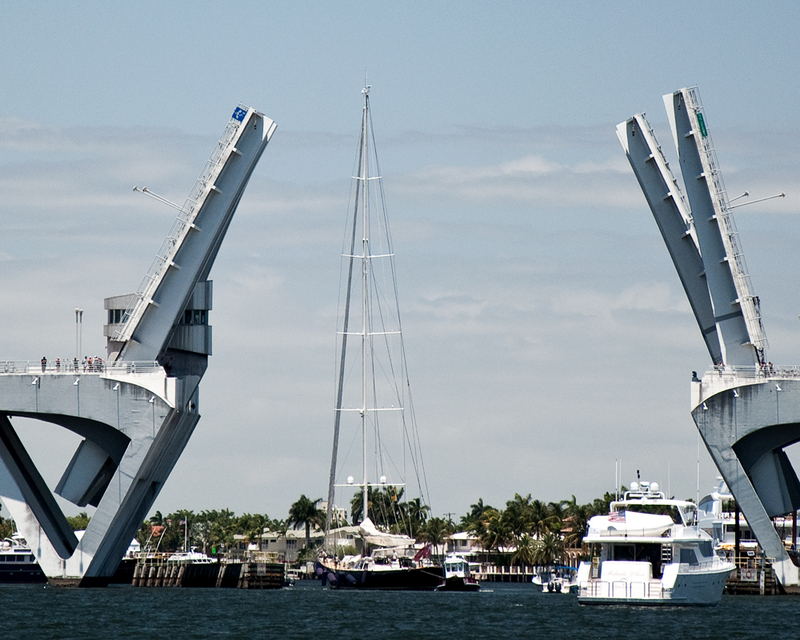 Some are fixed and 65 feet high, which easily accommodates our 55-foot mast, but most are low drawbridges or bascule bridges which have to open to let sailboats and other large boats go through. Since they typically open on a schedule, you have to pay attention to arriving at the bridge at the right time, otherwise you miss the opening and have to circle for a half an hour until the next one. For the most part, everything went beautifully. There was very little traffic on the ICW since it was a week day. But there was one bridge near Miami that gave us grief. The ruler beside the Julia Tuttle bridge said we were supposed to have 56 feet of clearance, and our mast is just over 55 feet, so we knew it would be close. But there should have been room. 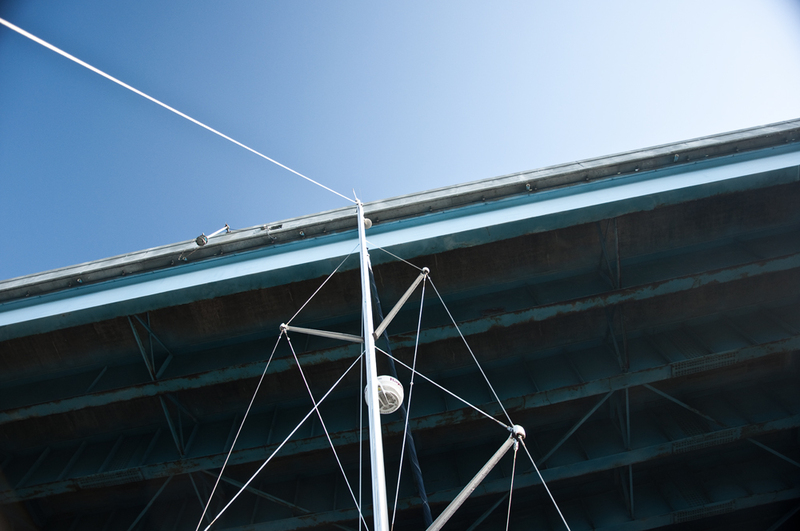 I was looking up when we went through and saw something on the top of our mast hit the bridge and fly off in pieces. I was afraid it was our antenna. That would have left us without a good VHF radio. (We have a handheld one that we can use in a pinch.) But it turned out to be our anchor light. Bob tells me we have an extra one and is threatening to send me up the mast to replace it. Such a funny man! At noon, we had one more bridge to go through before reaching Fort Lauderdale. As we were coming through Port Everglades where all the cruise ships head out to sea, we saw some commotion around the 17th Street Bridge. A sailboat with a draft of 14 feet 3 inches had run aground right in the middle of going through the bridge. Two tow boats were struggling to get him off. We joined a small parade of sailboats and other boats circling around for an hour or so until the situation was resolved. The poor captain was very apologetic to everyone for holding us all up. He said he had successfully made it through that bridge in the past. But the tide was pretty low today so perhaps that was it. If we hadn’t hit this snag, we were thinking of continuing on to Boca Raton. Instead we’re moored just before the Las Olas bascule bridge in Fort Lauderdale and we have access to the Municipal Marina facilities, including Wifi. On to Boca Raton tomorrow! I can only imagine what their journey must have been like…they were real pioneers. You may get a better idea from the video I posted, although this was a very easy opening on a great day with no traffic. They aren’t all like that! Very interesting, Sherry! Sorry about your anchor light. My husband’s parents journeyed up the ICW about 35 years ago, after sailing across the Atlantic. It was a fascinating voyage then and I’m sure it’s equally fascinating now – though probably even busier these days! I’ve forwarded your link to my father-in-law as he also found those bridges very interesting, so I know he’ll enjoy your post.